Wow! This gal (and a lot of people commenting) need to get out and check the real world every once in a while. It is a very straightforward delivery screw-up. I'm not sure how you reconcile the "NSA-know-it-all-nefarious-out-to-get-you-very-powerful-very-sneaky" type you all talk about with what would clearly be the dumbest way of intercepting a package. Have you guys heard of Occam's Razor? 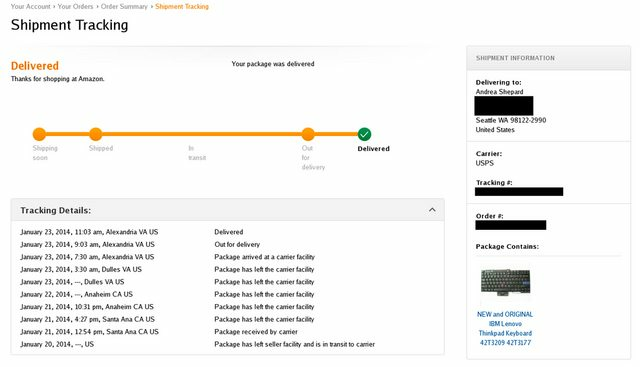 How about a package being sent to the wrong destination by a not-very-competent service? I've had a coffee machine that was supposed to be delivered from the west coast to the east one, reach Newark, cross the Atlantic and hit Paris and then piruet, go to Memphis and then merrily reach the East Coast. I thought it was a simple routing mistake and I still do. However, I would like to know how many of you think the French DGSE put some chip on it to check on my coffee-drinking habits.